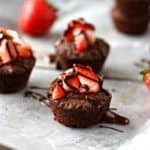 Home » Desserts » Gluten Free Vegan Brownie Bites. Gluten Free Vegan Brownie Bites. These gluten free vegan brownie bites are chocolatey, chewy, and just the right size for a little treat! Enjoy them plain, or topped with strawberries and chocolate. Brownies are always a little tricky to get right, aren’t they? Even if you aren’t dealing with special ingredients, it can be tough to get the right level of chocolatey flavor and the right texture. And if you can’t have gluten, or butter, or eggs, then the recipe becomes even trickier! I know I’ve tried my fair share of gluten free brownie mixes and have had less than stellar results. But these little gluten free and vegan brownie bites are just right! Chewy, chocolatey, and the perfect cute little size. 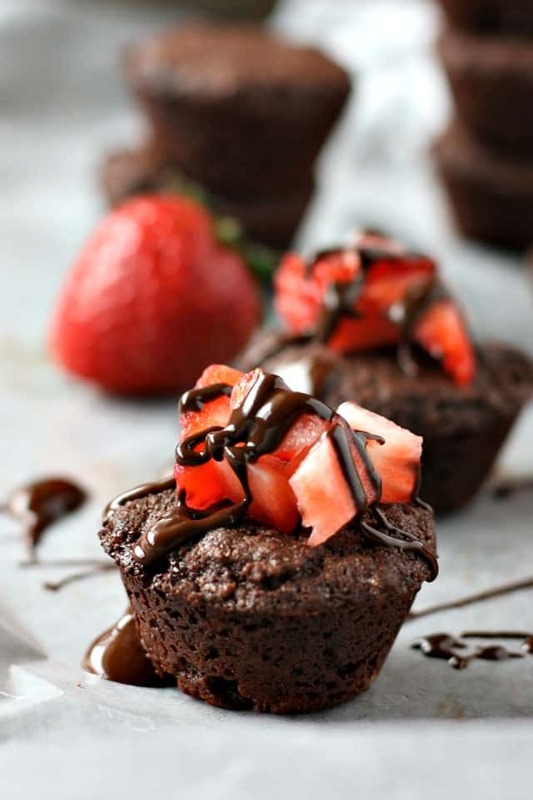 They are perfect on their own, or dressed up with a little melted chocolate and chopped strawberries on top. How do you make gluten free vegan brownie bites? Melt the chocolate chips in a microwave safe bowl, then stir to make sure they are melted. Add the vegan buttery spread. Stir in the sugar, cocoa powder, gluten free flour, applesauce, and salt. The batter will be thick. 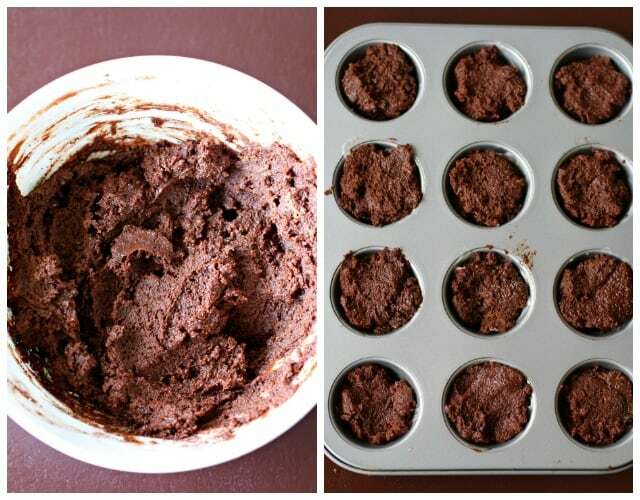 Spoon into a mini muffin tin and flatten the top of each mini muffin with a spoon. Bake at 350 degrees for about 15-17 minutes. What can be used in place of applesauce in this recipe? You can use beet puree, or even prune puree. Mashed banana would also work, but will impart a banana flavor to the brownie bites. I don’t recommend a flax egg because it will change the texture of these brownie bites. 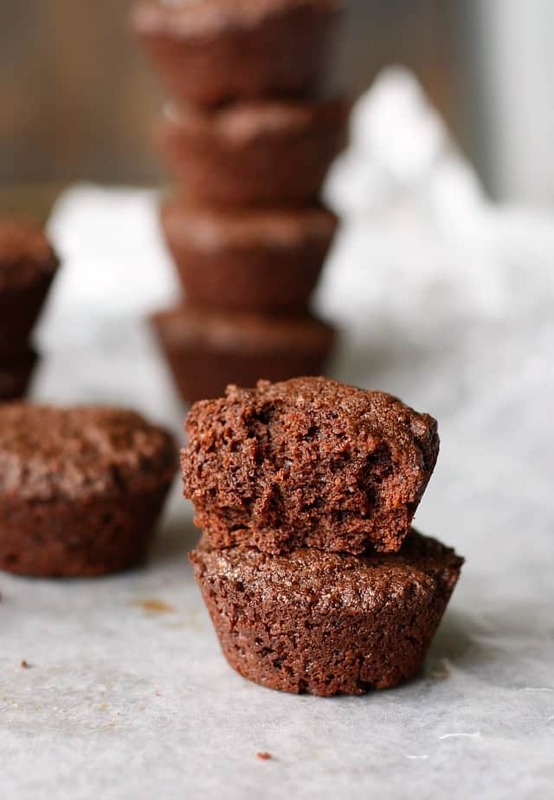 Can I make these brownie bites in a regular size muffin tin? You can if you want to! I would recommend only filling regular size muffin cups halfway, and the baking time may be a little bit longer. Keep an eye on them. Can I use a different sweetener? You can use coconut sugar, date sugar, or brown sugar if you wish! Maple syrup or other liquid sweeteners will change the texture of this recipe. What should I put on top of brownie bites? If you make this recipe, or any of my recipes, please share on Instagram and tag me @prettybeeblog. I love to see what you’re making! These mini chocolate treats are perfect for a party! 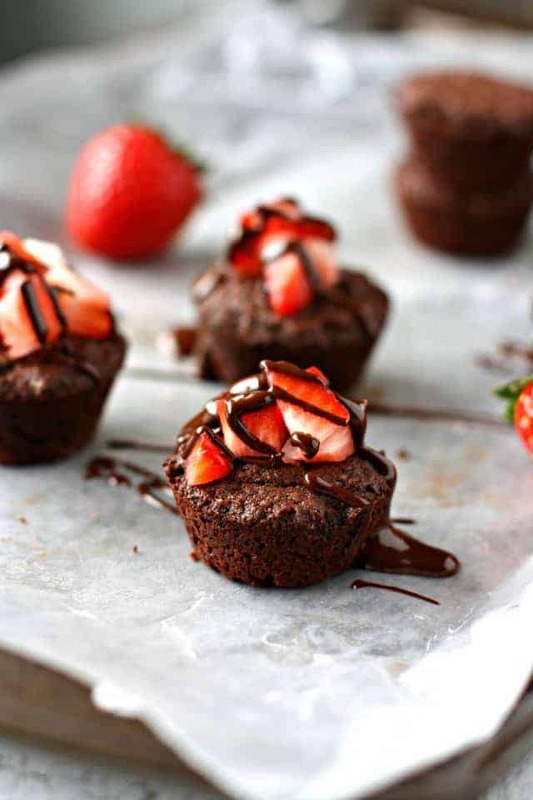 Enjoy gluten free brownie bites plain, or topped with berries and chocolate. Preheat oven to 350 degrees. Grease a muffin tin with a little vegan buttery spread. Place the 1/2 cup of 100% cacao chocolate chips in a large microwave safe bowl and heat for one minute. Stir, then heat in 10 second increments until melted. Add the vegan buttery spread to the hot chocolate chips and stir until melted. Add the sugar, cocoa powder, and applesauce, and stir. Add the gluten free flour and salt, and stir again. The batter will be very thick. If your batter is way too dry, add a little more applesauce. Put the batter into 18 wells of the muffin tin. Use the back of a spoon to smooth them out - the batter should reach the top of each well. Bake at 350 degrees for 14-16 minutes. Allow to cool in the pan for 10 minutes, then overturn the pan onto a cookie sheet and tap the bottom to remove the brownie bites. Place the 1/3 cup of chocolate chips in a microwave safe bowl and cook for one minute, then stir until smooth. 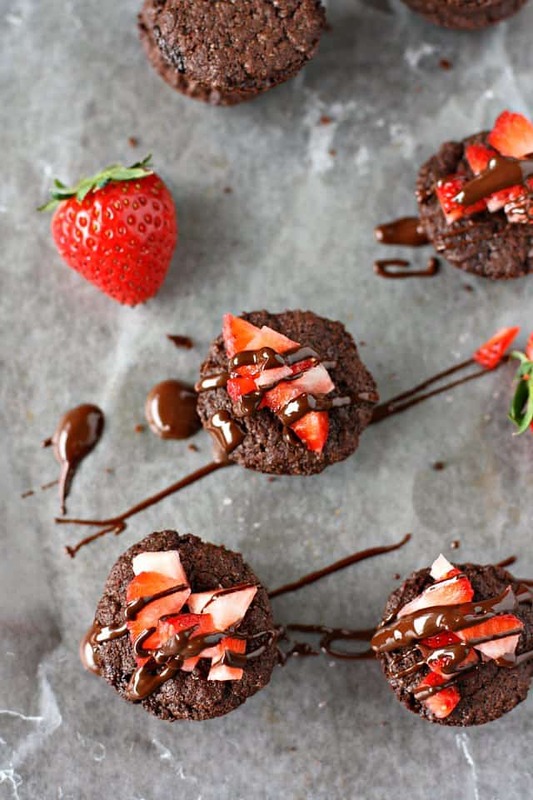 Place the chopped berries on each brownie bite, then drizzle some chocolate on top. Enjoy! Serving size is two brownie bites. Nutrition facts are for two bites with toppings. You can use different chocolate chips - they don't have to be unsweetened. However, your brownie bites will be sweeter than these. « Easy Gluten Free Vegan Fried Rice.